If you have been following my articles for the last few months, you know that we’re almost done with an experimental analysis and that today we will be doing the final step—making our company money. If you haven’t been following my articles, then you should probably be flogged with a soggy noodle until you admit to your other crimes in a tearful confession posted on YouTube. In addition, as Genichi Taguchi showed us, we incur losses as we deviate from the target, both on average and due to variation. We have a lower specification limit of 38, a target, if we can get it, of 52 (as that will allow us to match our competitors), and no upper specification. 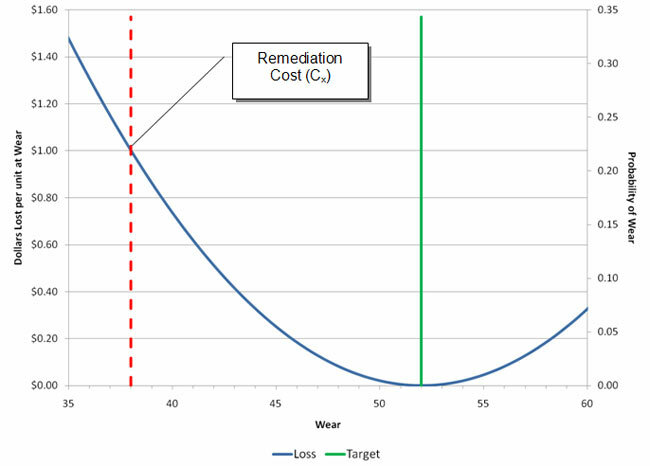 I proposed a remediation cost of $1 per unit, which is the loss of getting a part right at specification. If we put the spec and the Taguchi Loss Function on a graph, we get Figure 1. So that’s what we know so far. In the last article, I challenged you to determine which (if any) of the materials were the best choice. As it stands now, you could justify almost all of the materials based on one criterion or another. 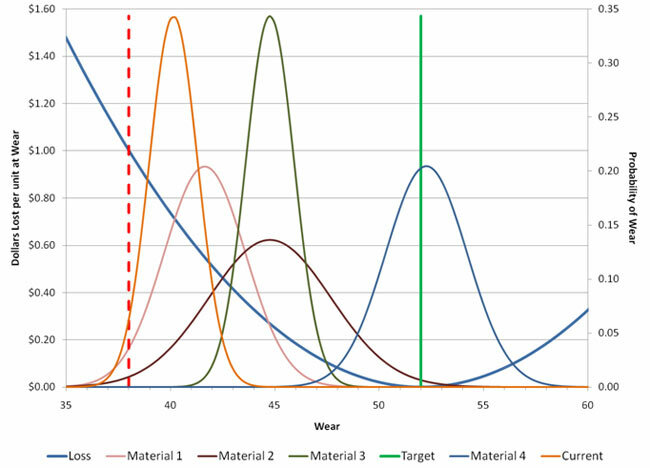 Material 4 has the highest average wear, but high variability too. Material 1 is the cheapest and is about the same on average as our current material, but it might be a little more variable than our current product and we can’t even make spec with that. Product 3 seems like a happy medium: it might be a little higher wear than our current project and it has a pretty low variability. Heck, there are probably people who would say to stick with the current material, because we have experience with it. This is a case where, depending on your criterion, you could end up selecting different materials. But the goal of Six Sigma is to minimize the costs of poor quality, and that’s the criterion we should be using. Luckily, the Taguchi loss function allows us to estimate the relative losses of the different materials. The losses aren’t necessarily exactly the dollar amount that you will experience, but the relative proportions of the cost differences are probably pretty close. To estimate the losses, we need to get point estimates of the averages and variances. You could use the sample means, but we know that these averages are subject to sampling error and differences between materials are only there due to chance and chance alone. So to get the best possible estimate of the “real” averages, we can “pool,” or average, the ones that are indistinguishable from one other. The tricky bit is when a material falls into two or more categories. In statistics we get to say funny things such as, “A = B and B = C but A ≠ C.” (Yeah, that one is a sure-fire laugh a minute with a statistician. A mad, high-pitched one in a small, padded room, but a laugh nonetheless.) But in real life, we know that B can’t be equal to both A and C if A and C are different, so we have to make a choice. It’s the same with our materials. If a setting only appears by itself in one subset, it’s its own point estimate (like Material 4 below). If a setting appears in two subsets, we can’t use it in both. If it always occurs in the other subsets with the same block of other settings, we pool the block to get the estimate (like Materials 2 and 3 below). If the setting occurs in more than one subset, but not with one or more other settings, it’s its own point estimate (like Material 1 below). Any settings that are left only appear in one subset and are pooled (like Material 5 below). Now heading into this analysis I want to make a picture so that I can see what’s going on. Using the pooled means and standard deviations we have just calculated, I generated Figure 1 to illustrate the output we would expect from each material. Now looking at this I could probably rule out anything that has a tail going below that lower spec limit. For sure those materials aren’t at a Six Sigma level. So realistically, I’m probably only looking at Material 3 and 4 as my two potentials. But we will go ahead and calculate losses for them all. The Taguchi loss function is no panacea, nor does it give exact dollar numbers, but it does give a pretty reliable relative rating of where the losses are generated. It is, of course, highly dependent on knowing what the optimum nominal really is. Businesses without this type of market intelligence really need to fix that first, because in the absence of a target, everything seems good, which means you can get anything. In my experience, the absence of a target is the source of a lot of “mysterious” and “inexplicable” problems that disappear once a target is put in place. What you want to avoid is making decisions without an understanding of the financial effects. Sure in this case choosing the most wear resistance material turned out to be the best, but you can easily picture circumstances where that wouldn’t be the case. By performing post-hocs, you might find that while the expensive setting happened to be higher this time, it’s really not statistically distinguishable from the cheaper setting. And hey, thanks for staying with me through this analysis. I hope that you can use these tools to save yourself and your company a lot of money. I know I had fun, and I think you did too. Special thanks again to MVPstats and PHAST-TM for making the analysis easy.